So we are delighted to say that as well as the signs at Five Ways, 18 out of the 19 Cyclists Dismount signs across Witney have been removed. We are very grateful to Oxfordshire Highways for listening to what we had to say and acting on their decision – just in time for our AGM too. It’s a very big thank you from all of us in WitneyBUG. That’s not to say that we think Five Ways roundabout is cycle friendly – far from it – in fact we agree with the sentiment that led to the signs being erected in the first place. However, we disagree that the Cyclists Dismount sign is the solution to the problem. Also, while we can help those who want, or need, to negotiate it safely with our cycle training, we recognise this is a sticking plaster rather than a cure. As you can see in the photo, the roundabout has a large radius with flared entry and exits; one doesn’t need to scrub off much speed if nothing’s coming, and that means traffic tends to be moving fast. The width of the lane around the roundabout is such that someone cycling around it at anything less than race speed can be passed alternately on the inside and the outside; at times this can be very unpleasant, particularly when trying to exit. Even from the driving seat it can be difficult to negotiate because some of the “arms” are so close together that, coupled with the speed of traffic, it can be hard to get onto the roundabout in the first place. This is just one of the cycle unfriendly junctions in Witney that need improvement. We’ve already been putting our collective mind to the task and we believe that Five Ways can be made better for all, whether walking, cycling or driving. There’s also an opportunity to link a quiet route from Moorland Road over to “old” Ducklington Lane with an off-road section around the roundabout. This would benefit families, as well as children cycling to/from school. That’ll take somewhat longer than removing the signs of course – quite a bit longer in fact. So in the meantime, here are the minutes from the WitneyBUG AGM, and let us raise a glass to the demise of the Cyclists Dismount sign and to the beginning of a new cycling era. Cheers! 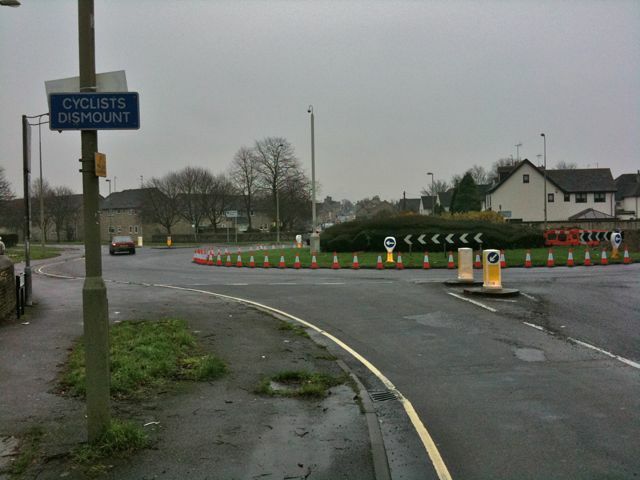 This entry was posted in WitneyBUG and tagged bikes, infrastructure, witney, words on Sun 6 Mar 2011 by kevin hickman.